Pants for women - Be Glossy In and Out! Pants first started as flared, resembling the men counterpart of the same fashion garment, since women wore dresses before pants took the game. But, it was a matter of time for the pants to start altering to prove more fitting for a feminine woman. Women have curves, and mostly they want to emphasize them, so why not tailor the classic evergreen piece? Then the slim pants for women emerged. 1 – Business look – We guess you are bored with the classic “black and white uniform” that consists of a pencils skirt and a random shirt. Although it is almost always very classy, it can get boring and too generic (we all know that feeling when all of your female colleagues look the same). If that’s the case, choose slim pants from stylewe.com. They have great fresh and modern variations, like these slightly printed dark ones. Paired with a subtle, feminine silk shirt, they make a perfect combo for the power business woman. 2 – Dinner look – If you have a night out that’s not exactly a night club, bur rather something more sophisticated, this is a perfect choice. Autumn inspired, dark burgundy slim pants blend so nicely with the mystic flowers on the medieval peasant blouse. Paired with high heels or even flat boots is great. 3 – Formal occasion – Splurge on this minimalistic look. Classic black slim pants are a must in every fashionista’s essential wardrobe, and this cut out white blouse makes a great ensemble with them. If you are on the go, throw on a contrast lapelled boyfriend blazer, and you’re good to go! 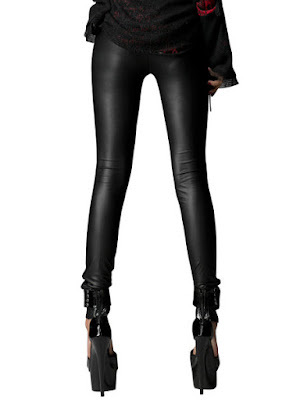 4 – Party look – You will be the queen of the dance floor with this pair of glossy patent leather slim pants. Whether it is paired with a basic blank top, or a plain bright one, it is a no mistake, fuss free choice for a club with the girl gang. 5 – Meeting look – This is another great example of work wear appropriate slim pants. Although they are not as skin tight as other examples, these are a perfect example of cigarette slim pants that are great with any shirt combined for a busy woman.